Jacqueline Pearce. What more needs saying? And oh, yes, someone’s had the bright idea to genetically modify the Vashta Nerada. While the “Fun World” story was moderately scary, this one is worse. You can’t ask for a better horror setting than the claustrophobic confines of a space station with hard vacuum just outside, doors to be breached or blocked, and vulnerable life support systems. Perfect hunting grounds for the Vashta Nerada. Once again,they’re only one of the Doctor’s problems. Dr. Morrison: There’s someone here, a Time Lord. Calls himself… a doctor? Did you want to fetch your guards? Cardinal Ollistra: Oh, no. I can handle the Doctor. I haven’t had a chance to start the Time War series yet, so I was looking forward to my first taste of Jacqueline Pearce as Cardinal Ollistra. Many of us have loved her ever since she sauntered onto the screen as Supreme Commander Servalan. She’s been typecast as shrewd, ruthless but classy ice queen ever since. Unsurprisingly, the chemistry between her and Paul McGann is understated but brilliant, laced with dry sarcasm and casual intelligence. Even in the midst of terrible danger, they have time for verbal sparring and ethical debates. Have a trailer for the whole boxset. There’s a spot of backstabbing, but for the most part it’s a suspense/disaster story requiring the Eighth Doctor to muster all his powers of ingenuity to keep people alive, door by door and room by room. With actors like these and a truly scary new Who monster on the loose, one doesn’t need a complex story to be gripping. As with all the stories in this series, Matt Fitton takes the basic idea of the Vashta Nerada from TV and expands on them, coming up with new dire twists and creepy imagery. Yes, even in audio, it’s possible to make silent monsters like Weeping Angels come alive. Most of the stories in Classic Doctors, New Monsters 2 look back to the classic era and forward to the new. The spectre of the Time War, implicitly or explicitly, bridges the past and future. That’s a clever way of making this collection more than just a disparate collection of stories. Once again, the orchestral new Who style music lends a more epic tone to these tales. “I like to acquire villains from other Doctors. I’ve acquired quite a lot from Tom Baker, and I’m sorting out his villains for him. He just left the job unfinished.” — Peter Davison in the interviews for Eldrad Must Die! Looks like Paul’s on mopup duty this time. 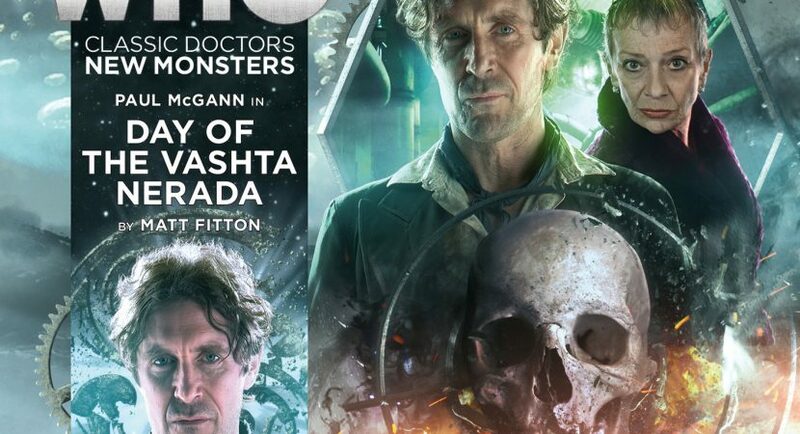 I present Big Finish’s Big Three Death Tropes To Make It Gritty and Real: (a) someone sacrifices themselves in the Doctor’s place to save the day [this also happened on classic Who] (b) the Doctor fails to rescue the sympathetic guest character he or a companion likes or (c) all the guest characters die. Bonus if (b) happens after it seems like the story’s over. At least in this audio, the Doctor is proactive and leads the party throughout, apart from a few moments when someone else takes up the hero-burden to let him and the others escape. So he doesn’t seem like an ineffective bystander, which sometimes happens when there’s multiple companions or an author’s pet character to dilute agency. As in most of the audios in this series, there’s a death too many, in my opinion, verging on the gratuitous. That said, I do appreciate the brief but biting exchange between the Doctor and Ollistra that follows, once again foreshadowing his role in the Time War which he is trying so hard to avoid.